There’s no question that the most memorable aspect of James Gunn’s Guardians of the Galaxy movies is the soundtrack. Gunn is meticulous about his music choices, and no character in the series is more representative of that than Groot, the treelike alien who found new life in Guardians of the Galaxy Vol. 2 as Baby Groot, the childlike version of the character who just loves a rockin’ beat. Apparently, the University of Southern California’s marching band, the Spirit of Troy, also got the memo, because the group performed a Guardians-themed march earlier this week. 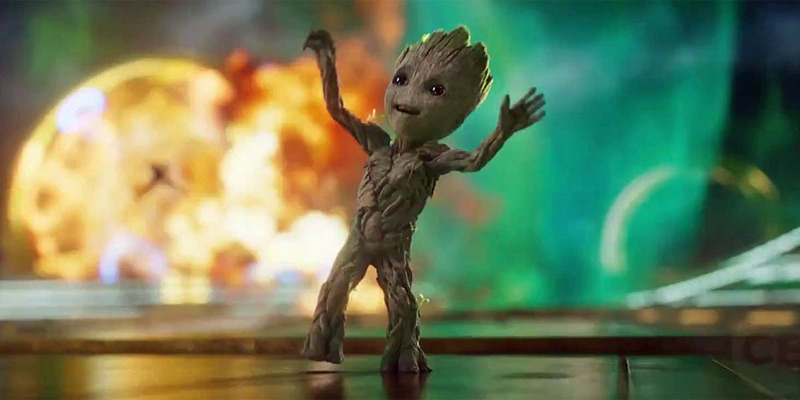 The video sees the band playing snippets of songs from the two films while its members march into the shape of a cassette tape, the Milano spaceship and, at the end, Baby Groot himself. Considering the show Baby Groot put on at the start of Guardians of the Galaxy Vol. 2, there’s no doubt he would approve of this performance. Written and directed by James Gunn, Guardians of the Galaxy Vol. 2 is out now on Digital HD from Amazon Video and iTunes, and on DVD and Blu-ray. The movie stars Chris Pratt, Zoe Saldana, Dave Bautista, Vin Diesel, Bradley Cooper, Michael Rooker, Karen Gillan, Pom Klementieff, Elizabeth Debicki, Chris Sullivan, Sean Gunn, Sylvester Stallone and Kurt Russell.